Cal Flame Cabanas create an elegant accent to your favorite outdoor seating area making an ideal complement to your outdoor patio or garden. Add a splash of style and shade to your outdoor BBQ space decor. The Cabana 3100 adds an elegant touch to your GPV3100 BBQ Island. 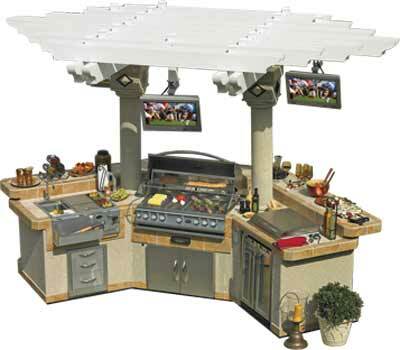 It provides a stylish way to complete your outdoor kitchen and provides shade during warm seasons. 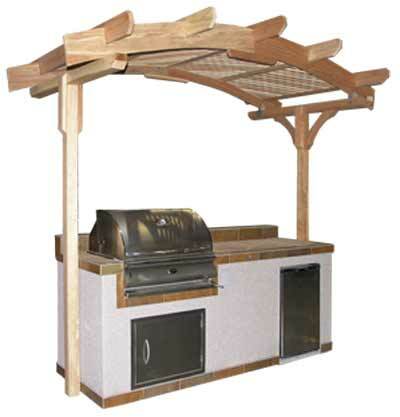 The Cabana 3100 fits perfectly over the GPV3100 BBQ Island and comes with two (2) wooden posts that secure tightly to the island and/or ground. The Arch Series cabana is a stylish way to complete your outdoor kitchen and provide shade during warm seasons. This wooden arch adds an elegant touch to any Cal Flame BBQ Island. It fits perfectly over the island and comes with two (2) wooden posts that secure tightly to the island and/or ground. The Arch is available with 8-foot or 12-foot roof styles.